Della reciproca ammirazione già ebbero a dire in una doppia intervista all'Independent, all'epoca della pubblicazione di Orpheus: The Lowdown. 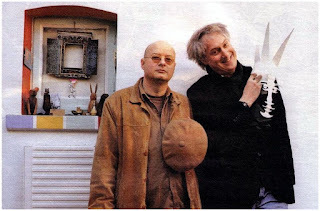 Per il 2011 Peter Blegvad e Andy Partridge hanno in serbo un nuovo album insieme, quasi ultimato: "We are nearly ready to start mixing on the new Peter Blegvad / Andy Partridge (and Stuart Rowe too!) album, provisionally titled Gonwards. What a banquet of baubles awaits your senses. Some of the titles to whet the palette are Devils Lexicon, The Cryonic Trombone, Saint Augustine Says, The Dope On Perelman and The Impeccable Dandy in White. Moving away from the total spoken Orpheus, Peter has moved part the way back to song and the album inhabits a thrilling sonic place that pulls in the blues, movie soundtrack, poems, advertising, dreams and lectures. As soon as the reverend Rowe has mangled all the sounds into submission, we know you'll love it." (Andy Partridge).